Hi everyone. More snow here at the Wren’s Nest. Since Thursday night we’ve had about five inches. The weather service says we’re due for some clearing today, but you could fool me. (I’m looking out my window at snowflakes falling lazily from a sky the color of old steel. )But all this white stuff reminded me that I hadn’t continued the story of my ski trip in the Alps, yet. So here’s another installment. If you haven’t read the first installment yet, this might be a good time to do it. You can read it here. 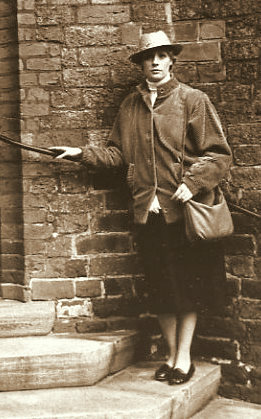 Wren in 1987, Bremen, Germany, not long after being diagnosed with RA. Yep, you read the headline right. The “gimp” would be yours truly in the late80s, diagnosed three years earlier with rheumatoid arthritis. Back then, along with attacking various joints all over my body, rheuma made the bottoms of both my feet ache. It was as if some malicious someone battered them with bamboo rods while I slept each night. They were painful, in varying degrees, almost all the time; it was like walking on sharp gravel barefooted. Standing for any length of time was excruciating. But I was young and strong and, with the exception of rheuma, ridiculously healthy. I was just 34. So when the opportunity presented itself, I went skiing. In the Alps. In January. With RA. Now, I didn’t know how to ski. My sole experience was a one-day ski trip when I was in elementary school. I spent most of that less-than-delightful day sitting in the snow, my Scotchgarded blue jeans wet through. I couldn’t seem to stay upright on my skis. When I fell down, I couldn’t figure out how to get back up without taking the skis off. It was a singularly freezing, humiliating and miserable experience. 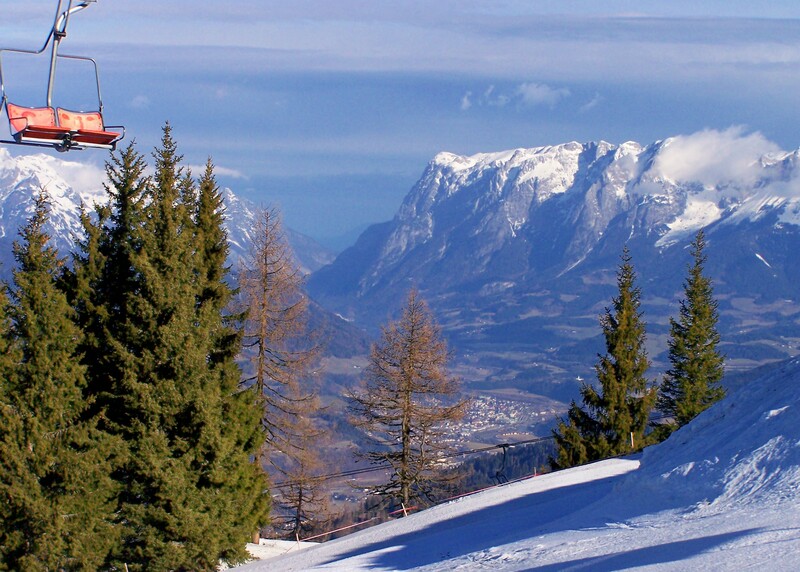 But here, in tiny, beautiful St. Veit im Pongau, Austria, I would take five days worth of ski lessons, courtesy of Siegi Baumgartner’s Red & White Ski Schule. I would soon, I thought, be one of the beautiful people, one of those fit, athletic, suntanned, sunglasses-wearing white-smiled people who zig-zagged at breakneck speeds down steep mountainsides, spraying roostertails of powdersnow from the backs of my long, skinny, stylish skis. I even had a wonderful, never-worn-before ski suit, black with bright pinks and yellows at the collar and cuffs. St. Veit im Pongau, Austria. 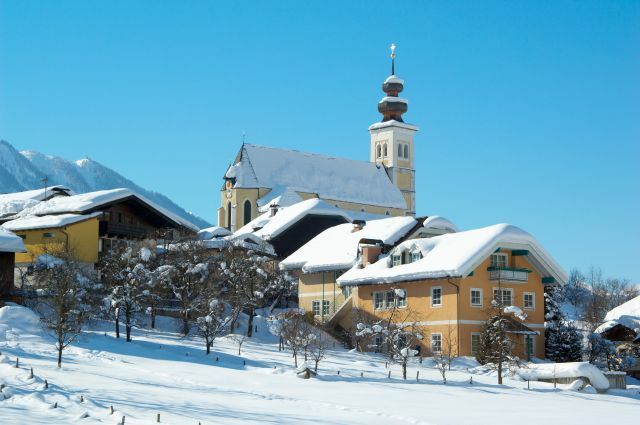 Our ski group stayed in this small Alpen village north of Salzburg for a week. But first I had to learn how to get back up after falling down. That first night, after our long journey by train, we attended Siegi’s welcome dinner in St. Veit im Pongau. This came complete with an oompah band, traditional Austrian dancers and Hans, our host’s elder brother, who demonstrated his yodeling prowess dressed in lederhosen, a pointed hat with a feather, kneesocks, silver-buckled shoes and suspenders. He did this after several toasts with the local berry liqueur, a startlingly sweet, fiery concoction which we all imbibed liberally with him, along with beer. He was wonderful – and yodeled with a completely mournful expression. Think Deputy Dawg in lederhosen. After we were all sufficiently stuffed with a nice hot, heavy, Austrian supper and desert – and plenty of booze — we all staggered, giggling, off to our respective lodgings (which were scattered throughout the village) for the night. We set off walking down the frozen, cobbled streets again, and without too much trouble found our chalet (a private residence equipped with extra rooms – did I mention the whole village was in on this money-making ski resort scheme of Siegi’s?). A friendly, smiling Hausfrau ushered us up to our room. I was about as tired as I’ve ever been. My feet were two hot, throbbing blocks at the ends of my legs. The room was quaint, warm and comfortable, and equipped with an en suite bathroom – a luxury, as in most smaller hotels and guesthouses in Europe, sharing a communal bathroom was the norm. The only drawback was that rather than having one of those gloriously deep bathtubs (I’d been dreaming of a steamy, hot bath since we’d made that last big train-change in Munich), there was just a small shower stall. Oh well. Can’t have everything, I thought, and dove headfirst into bed. We met punishingly early the next morning back at Siegi’s central meeting hall on the village square. Everyone was yawning and a little hung over, but we were all in good spirits and excited about the day of skiing ahead. In the ALPS! OMG, the Alps! Surrounded with a décor of oak, lace, thick, brocaded curtains and flowery seat cushions, we filled our queasy stomachs with a hearty Austrian-style breakfast of soft-boiled eggs in wee egg-cups, crispy bread rolls with cream cheese and jam, sliced Edam cheese and cold cuts, and subtly sweet pastries. This was all followed up with several cups of thick coffee strong enough to stimulate the spontaneous growth of chest hairs. Thus well-fortified, hangovers miraculously gone, my then-husband John and I set off to the ski rental place a few blocks over. Turned out it was owned and operated by Hans, the deadpan yodeler. Fitted with Frankenstein ski boots and provided with skis and poles, we clopped along and met our friends at the red-and-white SiegiTours bus, which trundled us four miles up a steep, winding road halfway up a monster mountain to St. Johann im Pongau, a much larger Austrian village which, along with numerous restaurants, chalet hotels and shops of all description, also boasted a big ski resort. The bus dropped us off in front of the resort’s tram building, where we bought our ski passes for the week and joined the queue for a tram ride up the mountain. I should mention here that I have always had a rather serious fear of heights. Inside the barn-like building, trams large enough to hold 20 or 30 people a pop glided in and out through huge doorways, suspended on giant pulley cables, propelled by a monstrous set of constantly turning wheels. The mechanisms dwarfed the line of people waiting, their breath steaming in the ice-cold air. This … thing … would carry us up to the ski area. Right. My stomach flip-flopped. But I filed in with everyone else, keeping my fear to myself. After all, I didn’t want to spend the week sitting alone in Siegi’s upholstered meeting hall, nursing berry liqueur and watching the snow fall. The only other way up the mountain would be to climb it on foot. Or take a helicopter. This story just screams COURAGE! Not just facing your fear of heights but also to tackle something as physically punishing as skiing with RA- especially when your feet were already in rough shape. That is just wonderfully inspiring. Can’t wait to read the rest of the story! Sounds like quite the trip, Wren. I have to say I’m terrified of chair lifts and have never been skiing as a result (no, not all Canadians live on skis and skates!). But horseback riding (and now needles! ), not a problem. Go figure! My mum is from Bremen! Gotta love that German food. I long for it in the winter when she’s down in Florida…all that hearty, stick-to-your-ribs goodness! What a vivid picture you paint with your words. Thank you for sharing this adventure with us. I have to admit that ‘sitting alone in Siegi’s upholstered meeting hall, nursing berry liqueur and watching the snow fall’ sounds kinda appealing to me – a whole lot more appealing than skiing. Just so long as I had a good book and, in those days, my Sony Walkman (now transposed into an i-pod), I’d have been happier there … and for me we’re talking about twenty years pre RA. What a wimp. ;o) You’d think a penguin would be keen to ski! Hi Leslie, I stumbled upon your blog and I have been reading your posts – I have RA too. I have been an avid skiier but in the last few years it has been really hard to ski with my RA. ITs such an extreme, crazy, joint-punishing sport! And wow that small alpine village you stayed in is so cute and charming! My brother is going to move to Germany this year. He loves it there and speaks fluent German. Have a great week! Fascinating story and excellent photos?